Programme Consultant with broad experience in managing, developing and implementing innovative development programmes for government, international organizations and civil society, that directly or indirectly involve digital technologies with limited resources in politically or technically constrained environments. 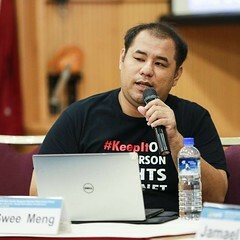 Has extensive cross-practice and cross-sector experience implementing programmes for UN agencies, governments and civil society in Asia-Pacific including digital rights, human rights, labour rights and environment. Also strong technical background in software development and systems administration with open source software, specifically FreeBSD and Linux operating systems, Python language and Plone CMS. Current area of interest is in applying innovative methods of open data and standards, for transparency and anti-corruption. Even though he is not as skilled in languages as his fellow team mates, but he primarily speaks Python, and a smattering of Go. In what little (if any) personal time left after spending time with his kids, he plays basketball, dabbles in gardening, playing keyboard and following what's happening in the different fields of design. Ng Swee Meng is Sinar's resident hybrid code monkey and server monkey for Sinar Project. Professionally experienced as a software engineer/programmer building web and backend applications in various environment. The tools of his choice are Linux, Python and Puppet. Generally, Ng Swee Meng spend the rest of his time on computer games and books. Occasionally, he is working hacking on code for fun and not necessarily profit. Michael is volunteering with Sinar Project since 2015 while on a year sabbatical from being IT Manager at Carlist.my. He is taking a lead on the Freedom of Information Enactment efforts including deploying the Alaveteli platform, engaging FOIE stakeholders and getting buy-in from Selangor, Penang government. Usually, Michael have several systems hat on; playing with Ansible and Docker. When putting on dev hat, he mainly in PHP language but learning Go for 2015! Kay is a contributing researcher at Sinar. She is currently pursuing her Bachelors in Computer Science with a specialisation in Data Science. 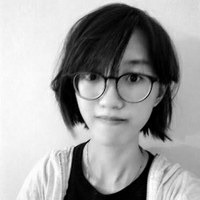 She is passionate about Machine Learning and data analysis, and is currently learning more about digital rights and open source development working at Sinar. In her free time, she’s usually working on her NLP project, learning new technologies, reading, and thinking about metaresearch. Chow Chee Leong is a sentient keyboard smashing robot often seen in flip flops. He is Sinar's most prolific community contributor. He works on scrapers, data cleanup/import and he is also often Sinar's developer representative for +Poplus components. 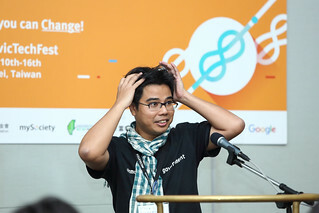 He helped rewrite the scraper for billwatcher, set up Sinar's local version of FixMyStreet, AduanKu.my, and helped importing a bunch of administrative boundaries for MapIt. Throughout the years of being an active sentient keyboard smashing robot, he develops in multiple languages including Python. Currently, he advocates for more GoLang and Docker use. Lara Powell is participating in the Global Affairs Canada International Youth Internship Program through Alternatives. After completing her Bachelor’s degree in Global Development Studies, she is thrilled to have the opportunity to gain practical experience in the development sector through an internship with Sinar Project. Lara is particularly interested in gender equity and is excited to help conduct a social audit on digital access and the digital gender gap in Subang Jaya. She is excited to learn more about digital rights, open government and online freedom of expression through her involvement with Sinar Project. Thanks to her commitment to social concerns and involvement with marginalized communities (Women's Aid Center, homeless shelters and literacy centers, ect...), Nawel has decided to focus her career in the social realm by working with NGOs specialized on social equity and human rights. She is currently participating in the Global Affairs Canada International Youth Internship Program through Alternatives as an intern for Sinar Project. Nawel will be involved in various projects in relation to the freedoms and rights of Malaysians, as well as the socio-political changes affecting South East Asia. Through this experience, she hopes to contribute to the improvement of access to information and ICTs and to the prosperity of the organisation and its social impact.